Reminiscent of old Hollywood glamour, the bar cart has long been a designer favorite. From nightstand, to kitchen caddy, to organizing cart in your office, the possibilities are endless. Our favorite use by far is a sophisticated cocktail station perfect for entertaining. There is something about this throwback that instantly livens up any corner of your home, leaving a lasting impression on anyone who walks through the door. Being the life of the party never looked so good, and these 12 swanky bar cart ideas prove it. Cheers! Love is in the air, at least in Lake Tahoe near the Truckee River, where Audere Events created a magical outdoor fête using a dreamy berry-hued color palette. 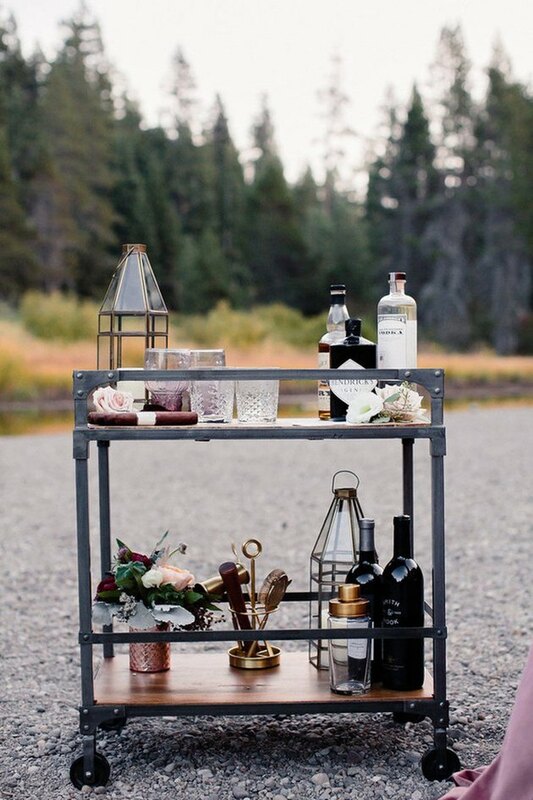 The enchanting elopement would not have been complete without a romantic bar cart to help celebrate the bride and groom. Outfitted with brass-trimmed candle lanterns, violet-tinted glassware, a brass bar tool set, and beautiful floral accents, this bar cart makes us swoon over every detail. 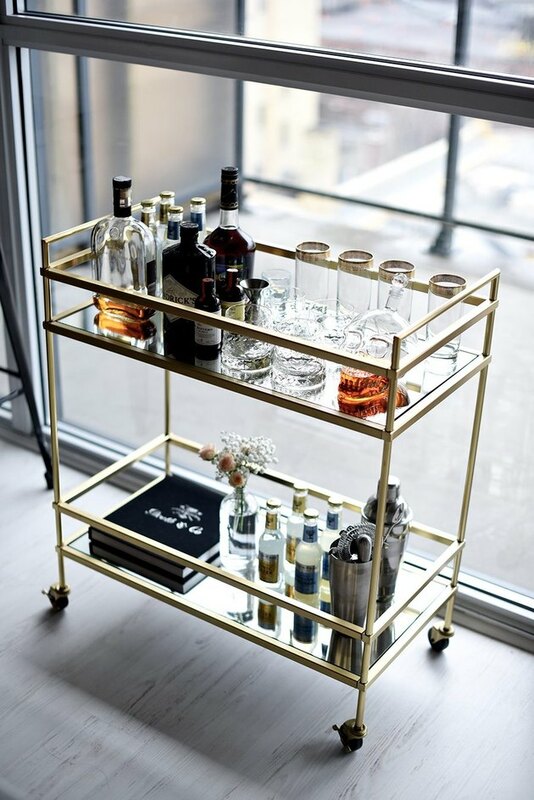 Even without the adult libations, this stunning and carefully edited, brass bar cart with clear glass shelves is easily one of our favorites! Pair it with a wireless speaker for a bit of music, some fresh blooms, a framed black-and-white custom print, and you've got yourself a drool-worthy nook perfect for enjoying a glass of wine or sparkling cider. The Los Angeles-based design firm Consort has really out done themselves this time. There are so many design moments worth mentioning in this refined Tribeca bachelor pad, and this stunning drink trolley is definitely one of them. 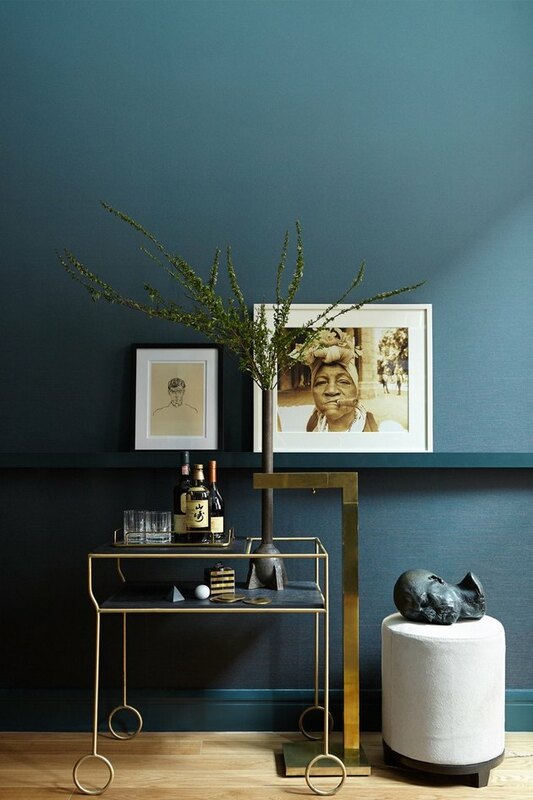 The deep jewel-tone wall color acts as the perfect backdrop for this sophisticated satin brass bar cart with slate tops. It's five o'clock somewhere, drinks anyone? When Kayla Seah, the Toronto-based blogger and creative voice behind Not Your Standard, moved into her new digs she had her hands full. However, the cocktail station is always a priority when unpacking — not to mention, they are just so much fun to style. This glamorous, art deco-inspired number from West Elm makes entertaining beautifully easy. Deck it out with gold-rimmed glassware, a clear-glass skull decanter, and your fave coffee table book for a completed look that is anything but standard. Let's get this party rolling! 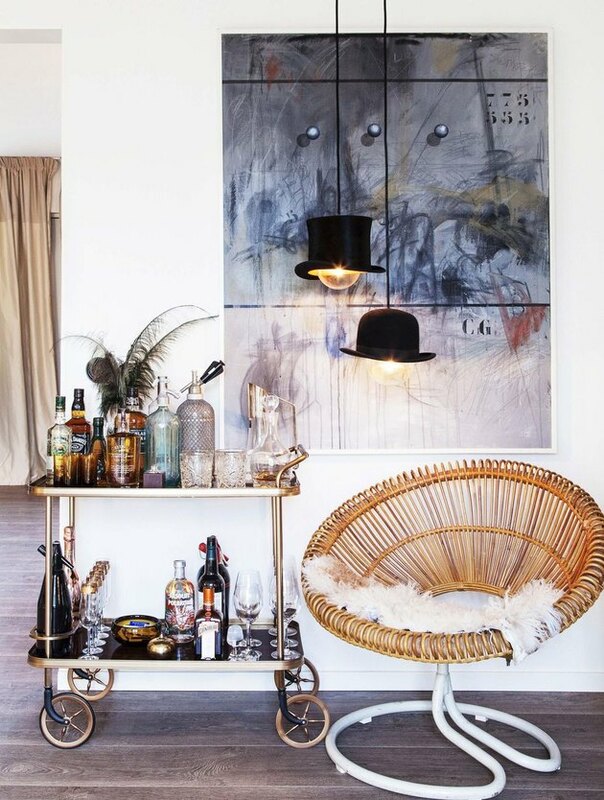 Parked next to a cluster of two pendant lights — a bowler hat and a top hat — this vintage bar cart is not one that you will soon forget. 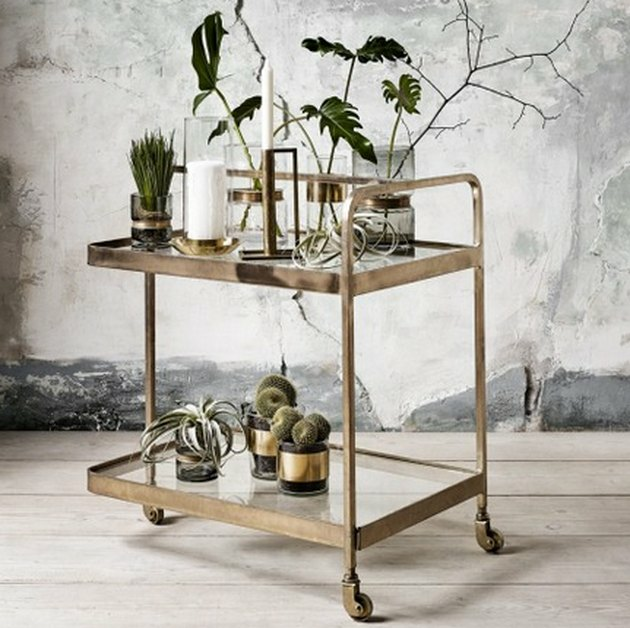 Re:Form Furniture owner Sandie Hasche's wondrous cocktail trolley is fully stocked and ready to go, accented with gold-rimmed glassware, an assortment of votive candles, and a couple of peacock feathers for a little extra flair. 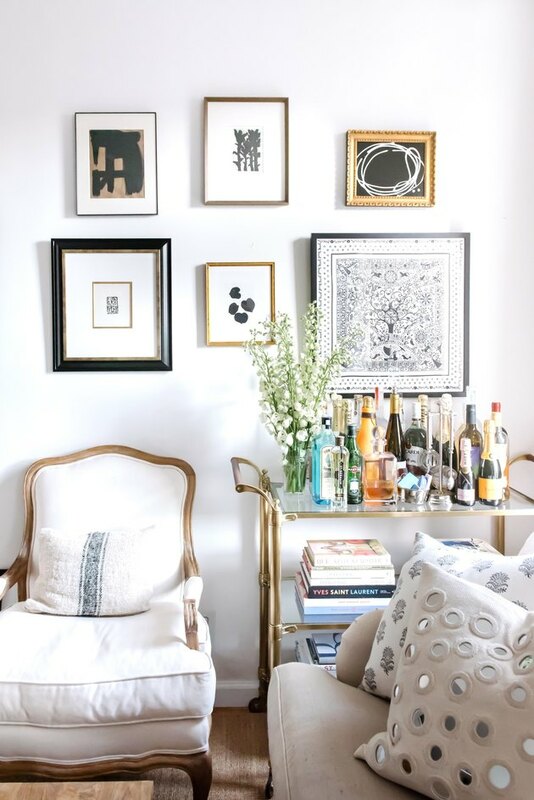 It should come as no surprise that fashion blogger Kat Tanita of With Love From Kat would have such a stylish bar cart in her gorgeous West Village apartment. Her antique brass Williams & Sonoma drink trolley is nestled next to a bergère chair with a framed Hermès pocket square hanging right above, which Tanita picked up during her travels in Florence. Adorned with some of our favorite fashion and design books, we can imagine sitting here all day. When Lenzo asked Wanderlust Creative to style a bright and colorful wedding inspiration shoot, they did not disappoint. Our favorite part, of course, is the gold-finished art deco bar cart filled with yummy treats and eye candy including delicious macaroons, a scented candle, and stunning fresh peonies. 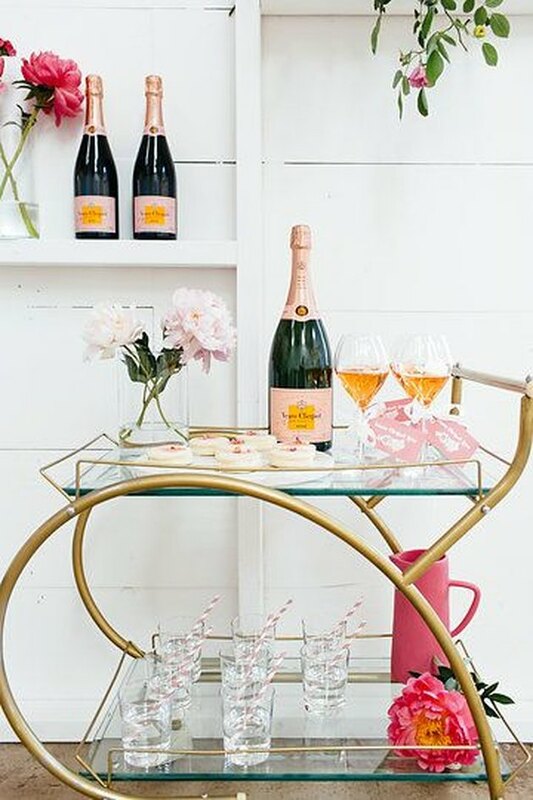 You really can't go wrong with a Veuve Clicquot Rosé stocked drink trolley. Bohemian cottage dweller and the voice behind The Tiny Canal Cottage, Whitney Leigh Morris, knows a thing or two about small space living — and yes, it includes a bar cart. 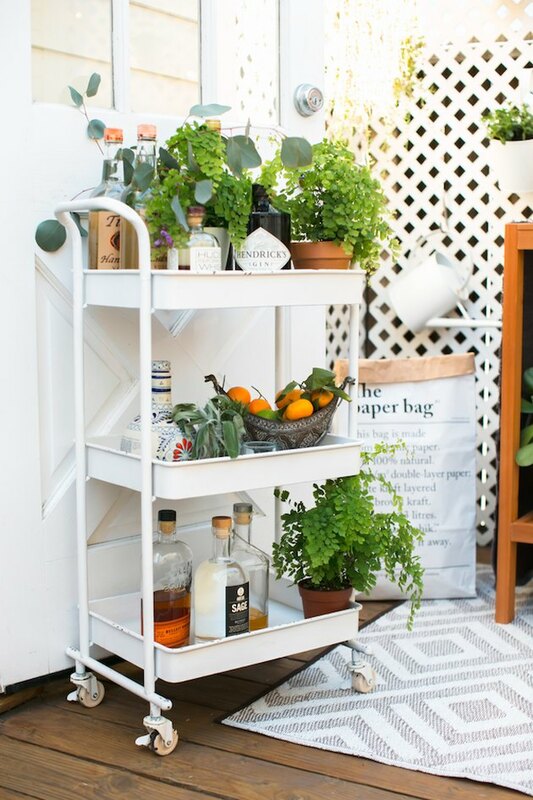 We just adore her charming drink trolley filled with small terra-cotta potted plants, fresh fruit, and most importantly, alcohol. This a great option for an intimate garden party, or just Sunday morning mimosas in your own backyard. 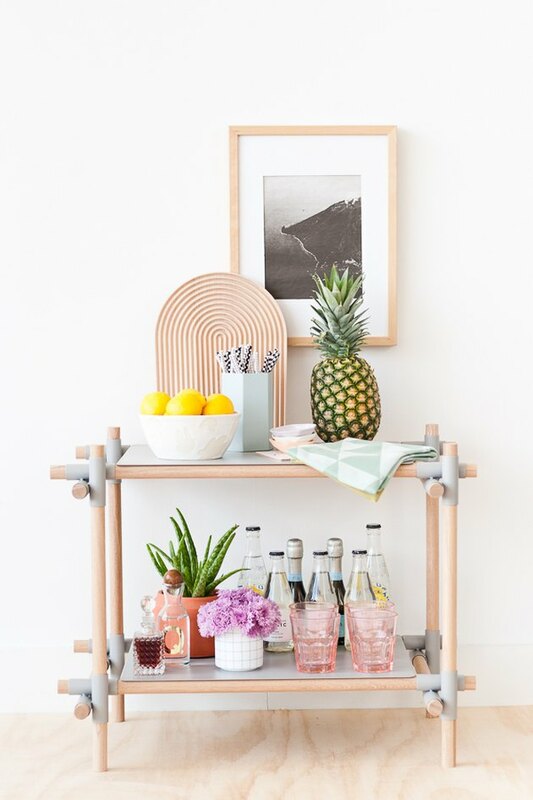 When Brittni Mehlhoff, the editor behind Paper & Stitch saw this Wayfair shelving unit it just screamed, "'I totally want to be a bar cart." And voilà! She transformed an ordinary piece of furniture into a cocktail station perfect for summer soirèes. Rose-colored glasses paired with fresh blooms, an agave plant, geometric print tea towels, a cutting board, and some tropical fruit create a bright and colorful bar cart that even the finest mixologists could appreciate. If your morning coffee is more important to you than an after work night cap, then this cart's for you. 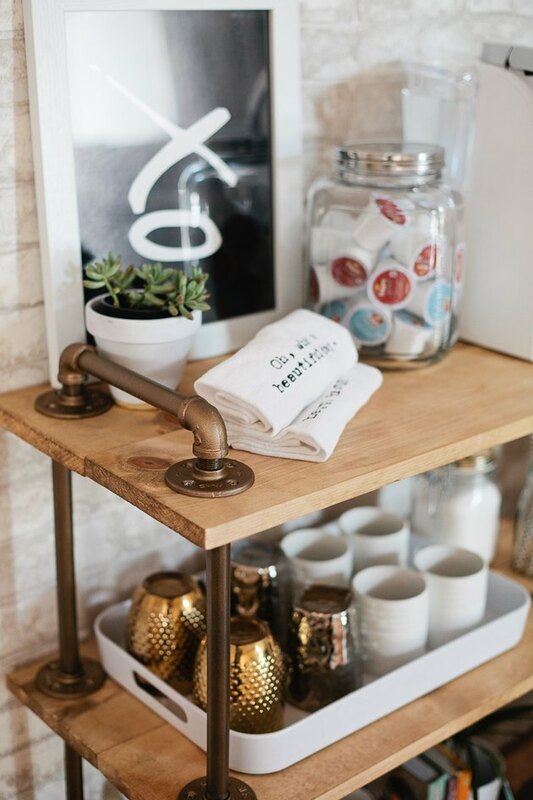 Fresh Mommy Blog's Tabitha Blue received help from her entire family to DIY this handsome coffee bar cart. Handcrafted with love, the Blue tribe constructed a rustic drink trolley in 16 easy steps that you can also create for your own home. Now, after all of that hard work, we think you deserve a coffee break. 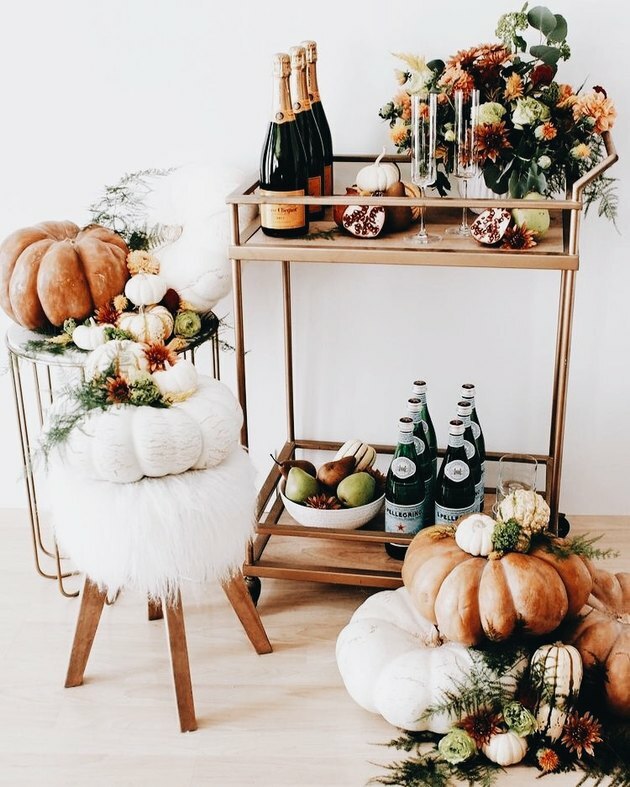 We love how Lauren from A Fabulous Fete captured the autumn spirit with this beautifully styled bar cart perfect for Thanksgiving. Dripping in fall colors, Lauren decorated this brass-finished cocktail trolley with a harvest floral bouquet, mini pumpkins, fruit, and champagne, of course. She even went one step further and arranged a collection of fairytale pumpkins and floral accents to create a magical vignette that people won't soon forget. This holiday season take a note from Garvin and Co. and adorn your bar cart with a lush-green pine garland, festive drinkware, copper mugs, and a mini Christmas tree. 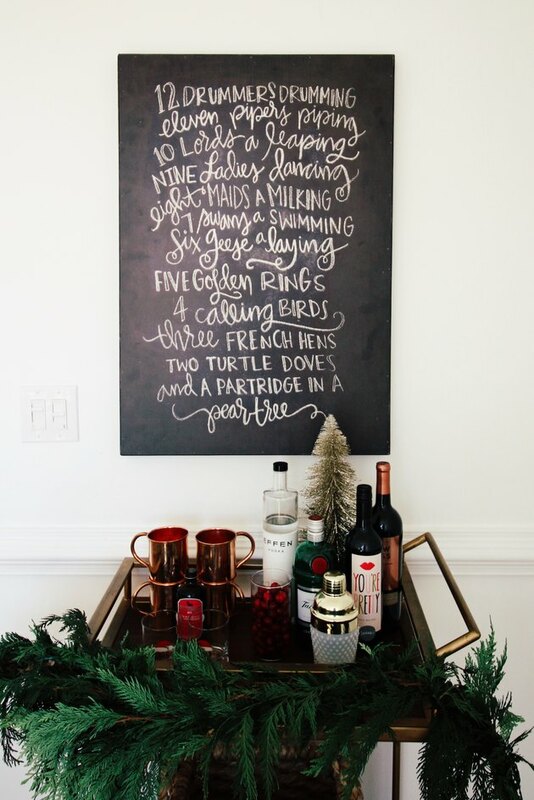 Last but not least, this jolly scene would not be complete without a print of the 12 Days of Christmas lyrics, or a sprig of rosemary and some cranberries to garnish your merry cocktails. Bottoms up!